the participating players. Suppose you limped into the hand from the small blind with an offsuit 6, 7. Say the flop comes out 4, 8, K(ing). You have a so-called gut-shot straight draw - 4, 6, 7, 8 - you need a 5 to make your straight. The chances of hitting a 5 on the next card are minimal out of all of the remaining cards in the deck. The only way you should pay $6 to see the next card is if there is a significant amount of money in the pot, which gives you favorable expected value (Without going into an in-depth lecture on poker strategy and probability, this simply means, over the long term, the possible winnings are high enough to justify paying $6 to see the next card because, if you were faced with that same bet multiple times over a long period of time, you would come out ahead). However, players in small stakes poker don't think that way. They tend to think more along the lines of "Well, I'm already in 'x' amount. The most I can lose is another $6." Small stakes poker takes a lot of the guess work out of the game. If you play good cards and know how to maximize your bet, you will come out ahead over time. 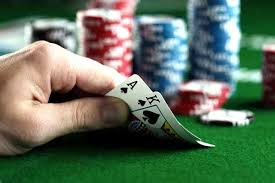 Most people don't play small stakes poker; instead they seek the roller coaster ride and glamour of No Limit Hold 'Em, where, in addition to playing the right cards and calculating your probability of winning a hand, you must also navigate the murky waters of reading the opposing players to decide whether or not they are bluffing. Why make it more complicated than it needs to be? Billy Beane, the GM of the Oakland Athletics, became a household name after Brad Pitt played his character in the 2011 film, "Moneyball". Beane utilized sabermetrics (defined in Wikipedia as "the empirical analysis of baseball, especially baseball statistics that measure in-game activity") to construct a winning, low-salary baseball team by signing on a number overlooked, underrated, efficient players. Instead of looking at batting average, look at runs scored and defensive competence, because that is what wins games. Beane's quantitative approach to managing the A's was extremely successful, leading to 20 straight wins in 2002, a feat that hadn't been accomplished in the over 100 year history of American League Baseball. Beane overruled scouts who had been in the game for decades, scouts who were adamant they could spot the next big star. The showy, hotshot players are not what he was looking for and he had the gumption to stick to his guns and build his team around quantitative results on the baseball field. The same strategies can be applied in all walks of life, every day, every step of the way. Overconfidence and the allure of fame, riches, or a quick victory, trump the more-sure, but mundane path to achievement. No need to constantly swing for the fences to be a winner. 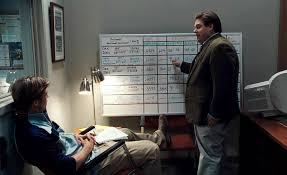 Your goal-seeking needs to be set up like Billy Beane playing small-stakes poker. Play only the hands that have the best probability of winning while wagering as little as possible. The poker hands are your tasks, the cost is your time, energy, and resources. Put your eggs in a few different baskets that have a high probability of success. Concentrate your energy on the tasks that will most likely help you to reach your goal. Take the guesswork out of it and leave as little to chance as possible, conserving your resources for more favorable opportunities. Our time is finite; you only have so much of it to spend. None of this means you shouldn't take risks; it means you should take calculated risks. Have an idea of what you want each task to accomplish - how it correlates to reaching your goal. If you don't know, then it's probably not a worthwhile task! Limit your participation to tasks that are aligned with your ultimate goal. Watching TV: Low probability to help you achieve your goals at a relatively low cost of time and resources => Low benefit, Low cost. Read an educational book in your field of interest: High probability to advance your knowledge at a relatively low cost => High benefit, Low cost. Grabbing dinner with a mentor: High probability of learning something valuable at a calculated cost of time, energy, and money => High benefit, High cost (but possibly worthwhile if enough money is in the pot! i.e. if the benefits gained outweigh the resources expended). Get it? The idea is to narrow down your activities to the high benefit, low cost category and high benefit, high cost, assuming you're gaining more than you are expending. Drink beer all day and watch tv? Eventually, you'll find yourself underprepared at the poker table heads up against Billy Beane. I must say that I loved this article because of the way you started and the way you concluded the post. I was intrigued by the principles of betting and how it was utilized in a baseball team. Even though, I don't understand the concept of betting, I like when a principle or strategy can be utilized in any field or industry so you got my attention. I also admire they way you used this strategy for lifestyle. The idea of this post is to make us apply a strategy that will make us more productive. Thanks for sharing. TheBankrollers Looking forward to reading more. Great blog post. Really Great.